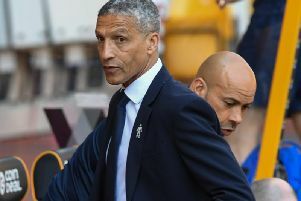 Brighton & Hove Albion manager Chris Hughton spoke to the press this morning ahead of tomorrow's Premier League match with Cardiff. Among the talking points were Saturday's 5-0 home defeat to Bournemouth, how big tomorrow's game with Cardiff is, recent form, Anthony Knockaert and more. "We're okay and there's no problems from Saturday. "At this moment, Anthony Knockaert is not available but everyone else is." If you win tomorrow you'll be eight points clear of the relegation zone and almost safe. How big is the game? "It's a big game and the fact we didn't get the result we wanted on Saturday makes it an even bigger game. You described Saturday as one of your worst defeats as a manager. How have the players reacted in the last couple of days? "The players have reacted well. We had the normal meeting yesterday and went through the game and the goals we conceded. "If I looked at this season it was probably our worst defeat and our worst performance but this is football. There isn't one player in the changing room who wouldn't have gone through a bad defeat, a bad performance and so. "It's always about how you respond to that. You respond to that because you're professional and you don't have a choice. "This is the game, the ups and downs, and I expect very much a reaction from our players." Can you explain the run of form you've been on and why results haven't gone your way? "The first one and the obvious one is we're playing in a very competitive league. We are newcomers as such to this league and it's the difficulties, the ups and downs and it's about adjusting to the qualities in this league. Can you blame the FA Cup run and the extra games for your league form? Are the players now more tired because of that? "I don't think you can look at excuses because you can always look at other teams who have been through similar. "What we probably haven't got at times is the depth in the squad in certain areas that maybe others have who have been through similar circumstances. "This is the game. There will never be any excuses here. If we are on our game, performing well then we have every chance of being in games. "We will stay as competitive as everybody else and everybody else will have the same amount of games and same difficulties and problems we have." How will you lift the players who were beaten 5-0 on Saturday for a game which could be season-defining? "I don't think there will be any difficulty in lifting the players because we were poor on Saturday. I know that and so does everybody else. They know it as players and they are the most important ones in this. "They'll want to prove a point on Tuesday and show an attitude that says they were that disappointed with Saturday. "There isn't one player that wouldn't have been through a difficult period, on the back of a bad defeat and the only way to turn that around and get the result you want is by working as hard as you can and applying yourself as hard as you can." Have you spoken to Anthony Knockaert after his red card against Bournemouth? "Yes I've spoken to Anthony. "It's very clear for everybody to see that it's a bad challenge that deserved the red card. "It's one he realises he hasn't done us any favours with. That's what happens when you put yourself in that position. "I've spoken to him and he is well aware the fact he deserved the red card." "I think it was a bit frustration and emotion. We had gone 2-0 down at that stage and he became a little bit frustrated. "What he can't afford to do is let frustration and emotion take part in the game. "At that stage of the game we are still in it irrespective of the fact we are not playing well enough to win the game. Things can change. "If you have 11 men on the pitch anything can still happen. "He is very aware of that." It was just over 20 years ago when Brighton almost went out of the Football League, you're now fighting to stay in the Premier League. Do the players get the history of the club and how big tomorrow and the next three weeks are? "Everybody gets the game that we are in but we still have games to play. "Last season we secured our Premier League status with the third to last game with only two games to go. "This is not unfamiliar territory. We are a battling club and are a club new to this division that are fighting with the rigours and quality of this division. "Every game for us is a big game. "Recent results have made this game a bigger one. "Everybody is very aware of what the game means and what the next five games mean. "We can't afford to put everything on this game. We will give everything to win it but we have a season to complete and there are five other games after this one to get the results we need."